← Winter Teaching Outfits that Rock! Last year I partnered with the lovely Leah ofÂ Awesome BarsÂ to provide you all with a tasty giveaway. This year, we’re doing it again! 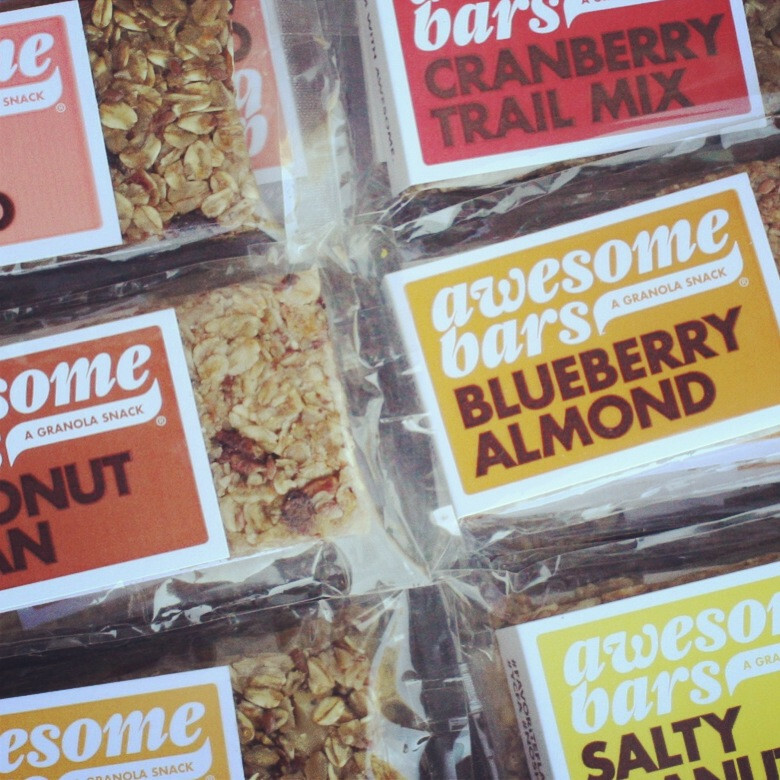 In honor of 2014, fresh starts, and whole foods we’re giving away ONE 6-bar variety pack which will include:Â Blueberry Almond, Cranberry Trail Mix, Cherry Almond, Salty Peanut, Coconut Pecan, and Apricot Walnut. Can you taste the awesome-ness yet? I love this company for many reasons. They have a great philosophy on whole, natural foods and they care about the product they are creating. Even the wrappers are compostable! With their real, organic ingredients you can be assured that you’re getting a delicious snack that makes you feel good inside and out. So, good luck! May the delicious-ness come your way soon. Oooh! I entered with the “blissandblessings.com/curlsdotnu Facebook Page Fan”! This sounds like a fun idea, I love entering in contests and giveaways! Awesome giveaway! I’ve been eating healthier for a 1+ year and exercising and I’ve been trying different protein bars and snacks, so these bars would be great to try! I would most like to try the Cherry Almond bar – I love those flavors individually, but haven’t had the opportunity to try them together! Cherry almond sounds delicious. I’ve never tried these before. I’m so excited for this giveaway! Such a good idea and they look so yummy By the way your link has been added as well I’m having a giveaway too if you’d like to check it out. Blueberry Almond & Cherry Almond sound delicious!!! I’m most excited to try the Coconut Pecan bar! Blueberry almond and coconut pecan sounds delicious! Great giveaway, btw! I’m most excited to try Coconut Pecan because I love BOTH those flavors and think the mix sounds nomtastical. This sounds tasty! The blueberry almond and salty peanut sound really go to me. The Salty Peanut sounds delicious! Blueberry Almond would be tasty. Thanks! I would love the Blueberry Almond! Oooohh! The flavors sound amazing! I’m definitely excited for the blueberry almond and the coconut pecan! Coconut Pecan?! Oh yum! This is a great giveaway Christine! These look delicious AND healthy. Good luck to all the contestants! Blueberry Almond sounds lovely and delicious!